The Vezina Trophy is awarded annually to the NHL goaltender seen as the best at his position in the league, and is decided on by a vote by all NHL General Managers. This years finalists Roberto Luongo, Pekka Rinne, and Tim Thomas shined through the regular season all surpassing the 30 win mark while maintaining a save percentage of 92% or better. This regular season confidence and success in all cases has carried over into this years post season with stellar play by all three goalies. Tim Thomas shined in game one against the Flyers, and he was highlighted even more by the lack of goal tending at the other end of the rink through out the game where the Flyers changed goaltenders mid game yet again. The other two finalists are put against one another in a series between the Predators and Canucks where through two games there has been plenty SportsCenter Top 10 worthy saves like the one below, where Pekka Rinne saves the game in the first overtime of game two. 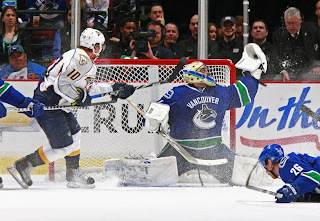 It is saves like that that have gotten the Predators to where they are today, tied with the Canucks 1-1 and heading back to Nashville where they will look for another Vezina worthy performance out of Rinne to grab a series lead. Luongo remains solid like always, except for the goal that tied game two with under two minutes to play, and seems to have shaken off his first round jitters where he was pulled in back to back games. Thomas kept the Bruins in the game with saves at key times while the guys in front of him pulled away on the scoreboard. All the goalies will continue to play their hardest and try to carry their teams into their respective Confrence Finals while strengthening their bids for the Vezina.